There are a lot of commercial contractors’ online resource directories that are used by the individuals to hire contractors based on their experience and reviews. These directories are quite important if you are in search of some professional vendors as well as construction contractors. Such online construction directories enable the individuals to find the vendors according to their project needs & requirements. In case you are running a construction business but you are not getting enough popularity then getting listed to such directories can lead you towards great business success. The only thing you must to do is list your construction business on a well-known construction industry online directory. After listing it, you will surely see a huge as well as positive change in your customers. However, to list your business in such directories, there is a proper guideline that you have to follow. 1. The first step to list your business in an online directory is to find a directory that you think can lead you towards success. Make sure to avoid listing the business on such online directories that are not well reputed and have negative reviews or very low number of daily visitors. The construction industry online directory on which you are going to list your business must be popular and well known. 2. While listing your business, when you are filling up all the business information, you also need to include the description of your business that other finds attractive. You need to do this because when a customer searches for vendors in building construction companies directory, they see a list of all vendors and each with a description. So, if your description is good then there are chances that you may get a new customer. 3. Also, to get the perfect business listing and to be successful with the help of online construction directories, the use of right keywords matter a lot. The keywords that are related to your business must always be used as these keywords may help you to rank at the top of the pages in the search engine. 4. On the off chance that your construction business is city based, getting it enlisted to a local online directory is advantageous. Several people search the services on e-directories and such directories have different categories that make the search easier. 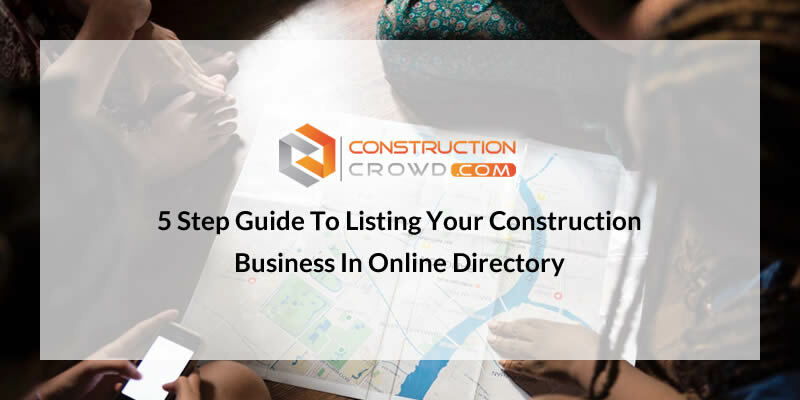 So, you can easily improve your construction business by providing services to the targeted audience after getting it enlisted in a construction industry online directory. 5. Last but not the least step to list your business successfully on a good online directory is to always provide correct business data. In any case, if you provide wrong data even by mistake then it may end up ruining your online reputation. So, make sure you keep this in mind if you really want to list your business on well-known directories.